I was trying to do this, and it was driving me up the wall. I put it in WEP mode, but the DS/Wii wouldn't take the password. The trick is you need to use the HEX password, which is not what Apple uses by default. You need to use "Equivalent Network Password" to see the WEP code the DS/Wii will want. Once you have this, it'll connect quite easily. 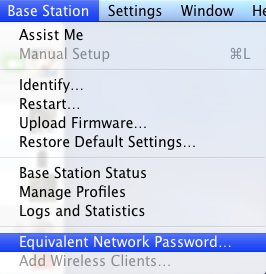 Of course if you're only using a Wii, you should use WPA2. Start VMware, and load your virtual machine. I put it directly under the proc entry. I was looking for some 1080p images, and found them at InterfaceLIFT.org. If you edit the URL a bit, you can directly search for 1080p. There are some very nice ones; now I only need to find some uncompressed TIFFs. I had forgotten to change a cronjob on my Mac Book Pro at home, but by the time I got to work and sshed back in, it was asleep. The server was on Gentoo, so I looked at the Gentoo wiki and found that "emerge wakeonlan" would get me the tool to wake up the Mac. But now I needed the MAC address, and it was asleep! But I remembered dhcp, and looked in /var/lib/dhcp/dhcp.leases and sure enough, there was the MAC address of the Mac. Running wakeonlan, waiting for it to come alive, and sshing in worked great.